It is not often that you come across an App that you can craft according to your own needs. 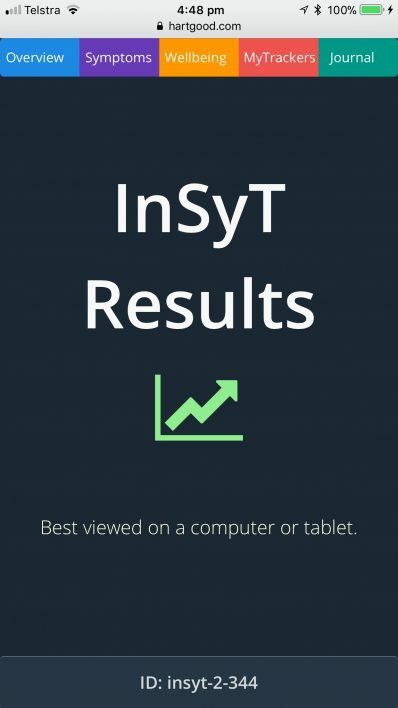 The InSyT App allows just this. We provide the base materials – components, ideas, human-friendly design, background code and research. And a state-of-the-art visualisation engine. Only needs 10 seconds per day or week to interact with. This is a WApp. A Web based App that runs on Smartphones, Tablets AND your Computer. Looks stunning on all devices. Inputs are visualised in real time. 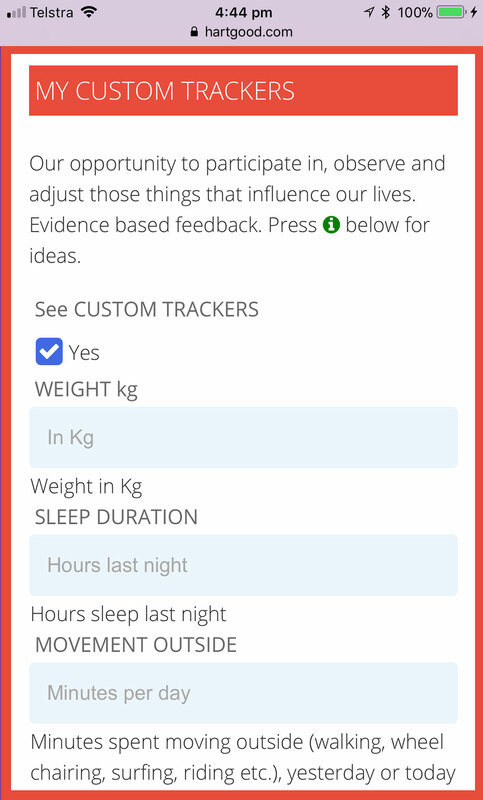 Visually rich and meaningful real-time feedback helps steer treatments or lifestyle changes. A powerful yet easy to use tool to monitor any lifestyle, nutritional, medical or allied health interventions. Health practitioners can monitor how patients are doing without extra paperwork, relying upon memory or replicating previous conversations. Patients assess whether a medication, lifestyle change or any treatment from a doctor or allied health practitioner is working. Most importantly, patients can avoid “falling through the cracks,” being overlooked, forgotten about or just ignored. Keeps everyone in the loop and accountable. Doctors & health practitioners can now use an evidence-based tool to track subtle or rapid changes in your symptoms. Only $120 for one year of tracking. Fully secure and private – no personally identifiable data stored online. 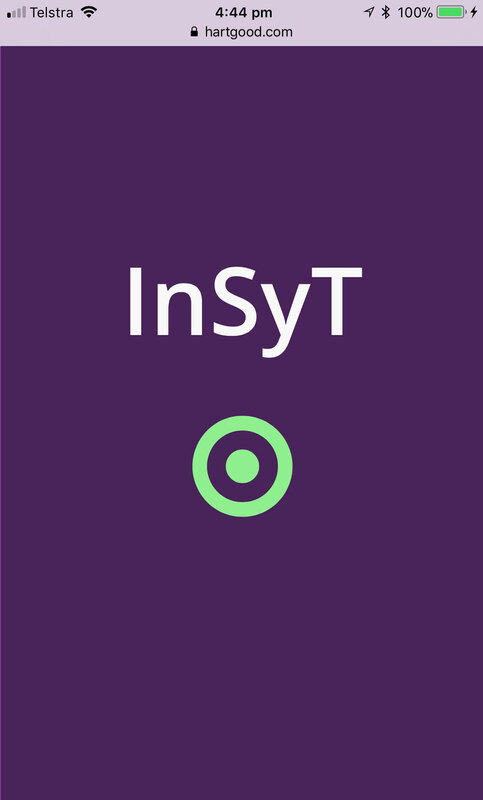 InSyt tracks your symptoms and matches them to any interventions you make in your life. You can also track virtually anything you can think of – at the same time. The tracking process takes about 10 seconds of your day once the tracker is setup-up and activated. You can setup your tracker now. Only takes a couple of minutes. To get started just choose your most annoying or debilitating symptoms from the list. We then construct your tracker and send you the details. We have meticulously chosen the symptoms and the terminology used based on years of clinical practice and common medical words employed by GP’s. Additionally, we researched the top 20 prescribed and over the counter medications around the world and collated all the major side effects. These are all included as symptoms in InSyT. To create and maintain this APP takes considerable resources. We kept the cost to an absolute minimum. $120 gives you one year of access and unlimited modifications. Full support is always available. First choose Symptoms you want to track by checking the boxes below. Choose up to 6 that are the most debilitating, severe or annoying to you. If your symptoms are not in list, then add your own under Unique Symptoms. Next choose any Custom Trackers. Add your own unique Custom-Designed Trackers if you want. You can also add custom aspects of Wellbeing and Transformation. The only limit is your imagination! 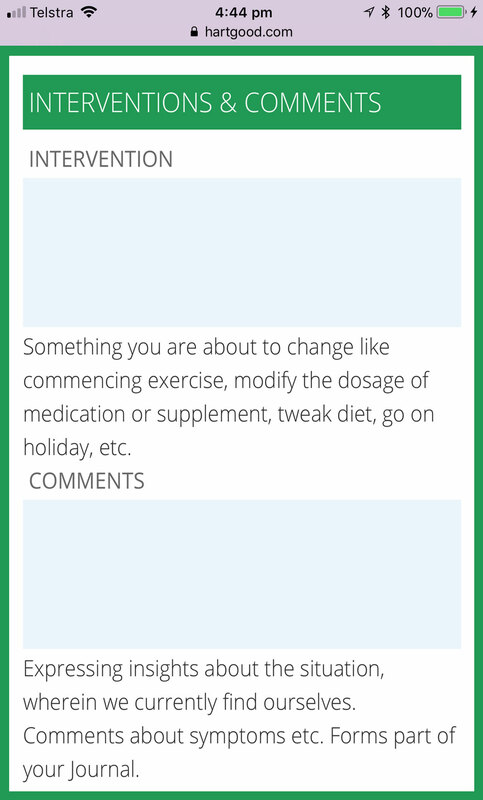 Your InSyT tracker will include an Intervention field and Comment field by default. Both of these provide important context. You can have a tracker with just these 2 fields which then makes your tracker a Journal. When finished press “Assemble my Tracker”. We will then email details to you. UNIQUE SYMPTOMS. Any Symptoms or Signs not in the list that you want to track. e.g Fruity smelling urine, red spots on neck, etc. Select and add custom trackers here. Your don't have to choose any. Some examples below to choose from. Otherwise define your own in next field. Movement Outside includes things like walking, wheel chairing, surfing, riding etc. Active Stillness entails things like being centered, listening, meditation, inner work, practicing mindfulness, focusing within, walking in nature etc. You will be able to select aspects of wellbeing & transformation listed below in your tracker. Otherwise define your own in next field. Being responsible, "doing the right thing"
Feelings of wellbeing and signs of transformation give us valuable and real time feedback on the quality, depth and breadth of our life. Attributes to transcend, aspire towards or actively seek out. We do not store your name and email online. Your tracker details will be sent to your email address. That's it. Tick finished and your Personilised Tracking App will be assembled and sent to you. Visualisation in many ways an alchemical process. Raw base material (data) is taken and put through a fire of code and consciousness to produce something of high value like gold (the visualisation). The purple area below demonstrates how the SYMPTOM section of an InSyT visualisation would look. You can immediately see that the image is fluid. Change the size of the window, and it will adapt and resize accordingly. Every aspect of colour, layout, font size and aesthetics has been meticulously chosen to enhance rapid comprehension of the take-home message. This enhanced clarity serves both the person doing the tracking and any health professional looking in. Importantly even though this is an App, these results can easily be emailed to your health professional or anyone you choose. The mind numbing problem of security of online health data is an issue encountered and mostly unsolved by even the big players like Google and Microsoft. Our policy of openness, learning and transparency required a simple solution to the security issue. As you can see, your results can be communicated via a simple URL. Results have no personally identifiable information at all. Nor does the input part of your InSyT App. Even the code behind the scenes offers zero tidbits for those programmers and hackers out there. You can choose up to nine symptoms to track at one time. The name of the symptom (REFLUX in this case) is shown on top. All symptoms are scored from 0-5 and explained in the KEY. This score is plotted on the vertical axis, and the DATE you made an input is shown on the horizontal axis. All InSyT inputs have a comment and an intervention field. 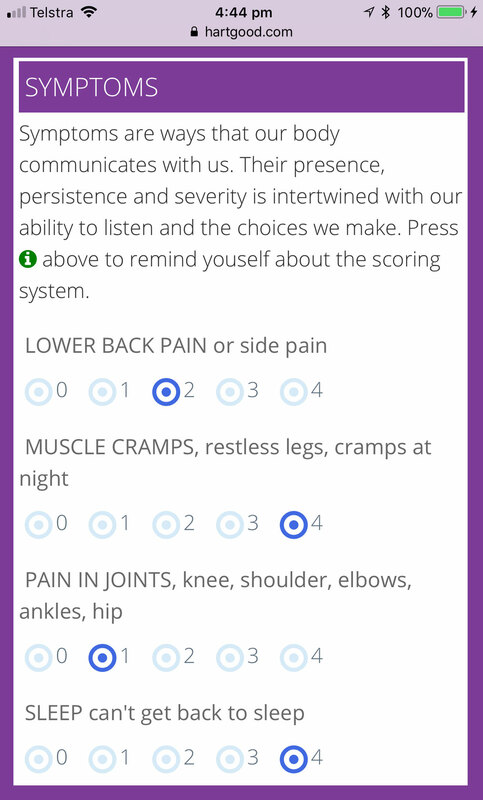 This means you can provide context when you record a symptom score on that day. Clicking on the yellow circle target will reveal the intervention on that particular DATE (and any additional comment). The solid yellow dots are comments only. Click on the yellow dots on the chart to see these comments and interventions. It can be challenging to gauge if you are improving or getting worse from some intervention over a time-period, especially if one day is good symptomatically while another is not. That’s why we introduced a trend line to help clarify this issue. If the trend line goes up over time, then this is an indication that the symptom is getting worse. An intervention is needed, or it means the current intervention is not working. In this example, however, the trend line is going down. Yippy. Upcoming articles will elucidate other veins of gold in the full visualisation. When you record an intervention or a comment in the tracker, it can be incorporated into this visualisation. This is where things get very powerful. See below to remind you of how symptoms are rated. Clicking on the yellow circle target will reveal the INTERVENTION on that particular DATE (and any additional comment). The solid yellow dots are comments only. If the trendline goes up over time, then this is an indication that the symptom is getting worse. An intervention is needed or it means the current intervention is not working.